Bela Lugosi appeared before his largest live audience in two sketches on Milton Berle’s hit TV show. 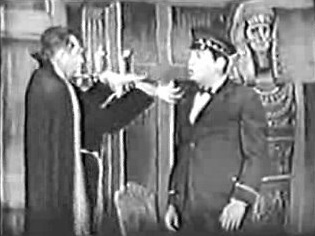 In one skit, in full Dracula costume, he tried to hypnotize the popular comedian into buying a house. Although it has long been stated that Berle’s constant ad-libbing and deviation from the script reduced Lugosi to a state of confusion, he doesn’t seem fazed in the surviving footage. 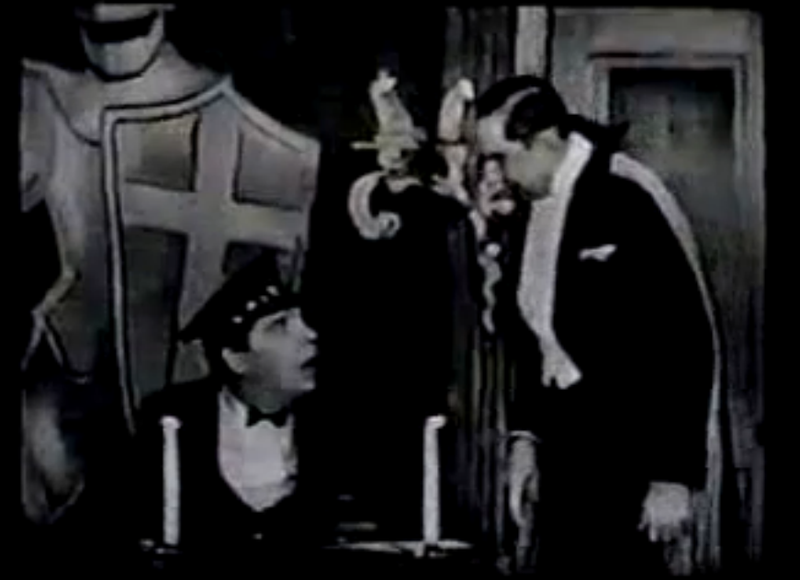 Lugosi played a mad scientist in the second skit. Note: This show is often wrongly listed as being broadcast on October 27th, but no broadcast took place on that day as it was a Thursday and the show was broadcast on Tuesdays. The October 25th show did not feature Bela Lugosi. Reviewed Thursday (27) 8-9 p.m. EDT. Sponsored by the Texas Company thru the Kudner Agency, via the National Broadcasting Company, New York. Producer-director, Ed Cashman. Cast: Milton Berle, Bill Robinson, Billie Burke, Jackie Robinson, Bela Lugosi, Al Roth orchestra, the Maxellos, Sid Stone. In some respects, tele does a lot of things radio does but on a much larger scale. It makes stars faster – witness Milton Berle; it builds ratings faster – witness Milton Berle – and it may exhaust show formulas much faster. Berle may eventually be the star witness on this last, too. The reason, obviously, is that the tenacious adherence to the formula quickly deprives it of the freshness so vital to continued success. Fred Aleen once observed that only a schnook tinkers with a successful formula, but Fred was speaking of radio, and years before television began reshaping the showbiz world. So it will become a question of time before Berle runs out of trick costumes for his first entrance, and a question of time before his repeated use of certain stock gags becomes as familiar to the TV audience as it is to perpetual night clubbers. This in no wise detracts from Berle as kingpin of TV, but it makes his problem that much more acute. In what direction do you travel from the top? Thus, skipping lightly over the first Texaco show of the series, and taking up with the second, it adds up to taking up just where the series wound up last spring, sans anything new – and noticeable short of outside acts to lend variety. The result was that not only did Berle work, as always, thruout virtually the entire show, but one of the acts, the ageless Bill Robinson – so great a showman – did his own number and participated in two others, one with Jackie Robinson, the Dodger ball player, and one in a Ziegfield nostalgia reprise session closing the show. If acts are short now, in the second week, what’s the outlook upcoming? The Ziegfeld number, cued in via Berle’s interview with Billie Burke, was high in nostalgia value, with a number of mimics doing Helen Morgan, W.C. Fields, Nora Bayes et al., winding up with Berle’s imitation of Eddie Cantor. The preceding palaver, tho, with Miss Burke, was entirely artificial and overly saccharine. Berle should make it a must to get one wild sketch into each show, the sort of slapstick, cornball idiocy built around Bela Lugosi on this show. It’s almost Keystone cop-like in its flavor; provides a wonderful pace for the show and provides ample opportunity for Berle’s own antics. Which the people want. Opener was the crack Risley foursome, the Maxellos, with Berle in, of course, for the bounce-around payoff. A later spot, with Jackie Robinson, was poorly handled, with the ace ball player standing awkwardly and abruptly cut off in the middle of an interview to bring on a baseball sketch. Sid Stone’s pitchman commercial, this time using a youngster caparisoned in like garb, was more than usually inventive.